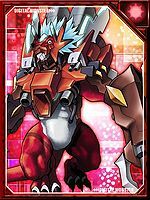 Difference between revisions of "Megalo Growmon X-Antibody"
Possessing the name "Great Growmon", it is a Cyborg-type Perfect Digimon. As its name suggests, its body has grown gigantic, and its upper body has been metallized with the strongest metal, "Chrome Digizoid". It is able to take flight with the two vernier attached to its shoulders, so it is possible for it to perform both anti-air and anti-ground attacks. In order to suppress its rampaging due to excess power, a restraining tool similar to a bit is attached to its jaw section. Also, since the "Assault Balancer" extending like a cable from its back section is extensible, it can be used to impale the opponent. 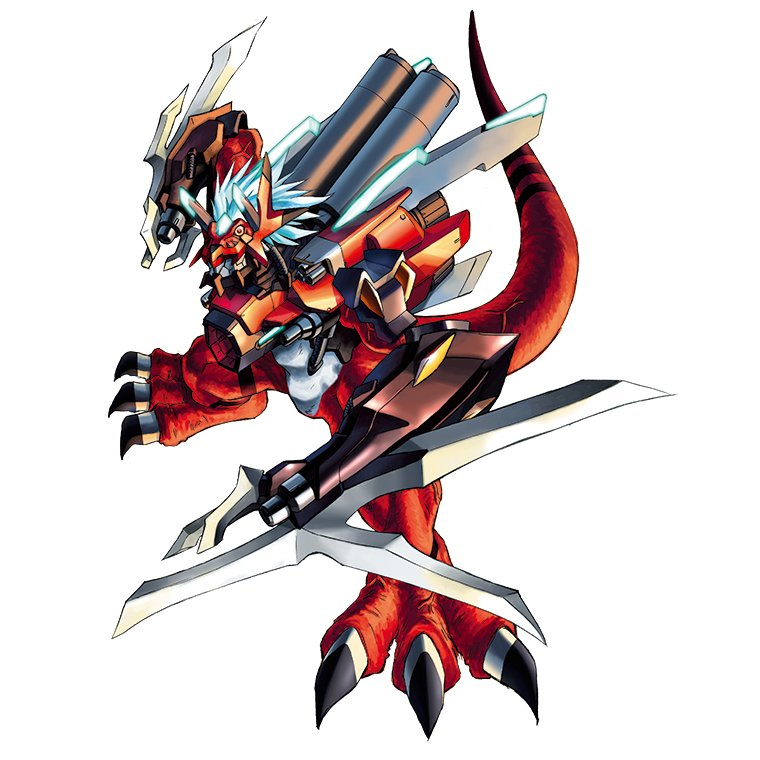 Its Signature Move is cutting the opponent to pieces with the "Pendulum Blades" on its arms (Double Edge). Its Special Move is an attack fired from both of the gunports on its chest that destroys the opponent on the atomic level (Atomic Blaster). 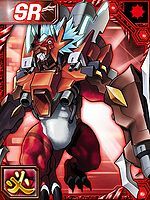 It gained the ability to change the extraordinary power of the "Digital Hazard" contained within its body into a variety of energy shots and fire them from the attack units on each part of it, and is called the "Deep-crimson Heavy Tank". 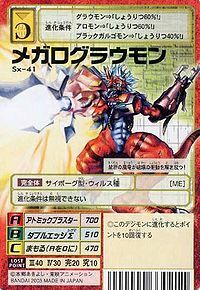 During close-combat, it performs its "Double Edge Σ" with the "Pendulum Blades Σ", and its Special Move "Atomic Blaster" is fired via the gunports on its chest and arms with four times the power. The huge gunport on its chest is a cannon for its "Atomic Megalo Blaster". 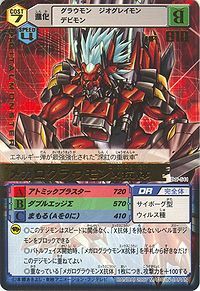 It is called the "Deep-crimson Heavy Tank" due to the fact that it transforms the extraordinary "Power" of the "Digital Hazard" contained within its body into a variety of energy shots, and fires them from the attack units on each part of it. 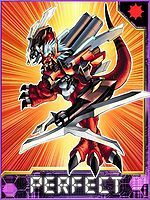 It manipulates the enormous "Pendulum Blades Σ" skillfully, even in close-combat, so there are no blind spots in both its offense and defense. Special Move: Its most powerful spreader cannon, fired from the huge gunport on its chest (Atomic Megalo Blaster). Title: 「深紅の重戦車」 — "Deep-crimson Heavy Tank"
| Megalo (μεγαλο) means "large, huge" and is a reference to the Megalosaurus 「メガロサウルス Megarosaurusu」, a genus of large carnivorous dinosaurs, and an implication of Megalo Growmon's given name, "Giant Growmon" 「巨大なグラウモン Kyodaina Guraumon」. | Grow is short for growl 「グラウル Gurauru」. Atomic Megalo Blaster  アトミックメガロブラスター Atomikku Megaro Burasutā Fires a beam from the huge central gun port on its chest. Atomic Blaster  アトミックブラスター Atomikku Burasutā Fires beams from the two small gun ports on its chest and the gun ports of its hands to destroy the enemy at the atomic level. 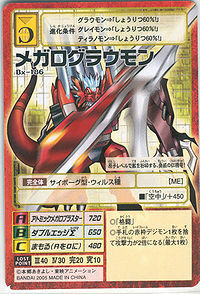 Double Edge Σ  ダブルエッジΣ Daburu Ejji Shiguma Cuts the opponent to pieces with its Pendulum Blades Σ. This forbidden demon dragon unleashes surges of destruction! This deep-red heavy tank is armed with crimson ferocity! 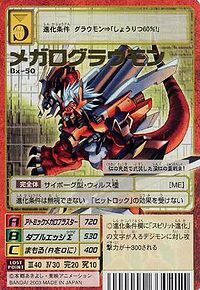 This menacing mechanical crimson dragon pulverises its opponents at the atomic level! This "Crimson Heavy Tank" has strengthened its energy bullets to their maximum power.